Millennials’ career progression is a hot topic at the moment. And it’s no secret that perks and benefits are now among the top things that candidates consider when deciding whether to accept a job. The results are now in! The questions have been live for a number of weeks we have analysed our data and discovered which perk, out of a choice of four, appealed to prospective employees the most. Working from home came out on top, with a staggering 43% of candidates choosing this as the most attractive perk. Close behind came the opportunity to attend events, such as free workshops and talks, with 33% of candidates selecting this option. 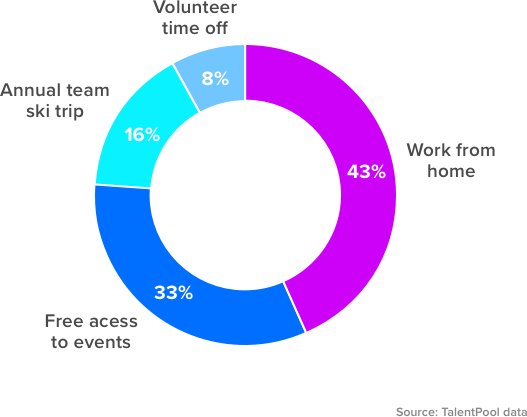 The final two perks; an annual team ski trip and time off to volunteer were chosen by 16% and 8% of candidates respectively. It’s relatively unsurprising that the option to work from home was the perk that came out on top. In recent years, the idea of remote working has become more common and is no longer thought of as a luxury only to be enjoyed by freelancers! With employers facing the ‘job-hopping’ epidemic that millennials pose, an increased number have welcomed the idea of their employees working from home, if it will result in increased retention rates. The constant development of new technology to aid communication means there is no longer the need for individuals, in certain roles, to be in an office with the rest of their team 5 days a week. It is also promising (and perhaps a little surprising!) to see that candidates would rather have the chance to attend events which give them the opportunity to expand their knowledge, and their networks, over attending an annual team ski trip. This demonstrates the keen interest millennials have in their industries and their drive to succeed in their careers. It’s clear that perks are hugely important to employees! This increased demand for workplace benefits is demonstrated by the rise of companies such as Perkbox – a platform dedicated to providing employees with the best perks possilbe. Have a read of our previous blog post to see some of the best perks in action at top UK SMEs. The Startup Stories podcast follows entrepreneurs as they talk about building successful brands and the highs and lows of having your own business. This episodes hears from Michelle You, co-founder of the music ticketing and concert discovery platform, Songkick. The majority of startups are faced with two options when it comes to funding: attempt to attract investment, or bootstrap (bootstrapping is building your business with your own resources from scratch). This EU-Startups article looks at the pros and cons of both options, based off of five questions you should ask yourself and your team. We all know that there are rarely enough hours in the day to get everything done but physicist Jim Al-Khalili is on hand to share his top tips on multitasking and managing multiple projects at once. So you can get a little bit closer to ticking everything off your to-do list!